Yellow crocus - don't let sparrows wreck them. This week: how to make a cat and tips for growing prizewinning parsnips. • The yellow botanical crocus are blooming in sheltered places. To prevent them being damaged by sparrows in the early morning, cut out the shape of a cat lying down. Now paint it black but with a white patch on the front to make it look realistic and thrust two marbles into where the eyes should be and place it nearby. That will keep sparrows off your crocus blooms. •The soil is wet but exhibitors will need to sow parsnip seeds soon. Fork over the soil which should have been dug deeply in the autumn, but NOT manured. Once dug, cover the rows with cloches to allow the surface to dry. This will also warm the soil a little, ready to sow parsnips at the end of this month. It is essential to buy fresh parsnip seed as last year’s will not germinate well. Parsnip seeds may be germinated in a jam jar in damp vermiculite. As soon as roots emerge, sow them in open ground which has been warmed as suggested above. • If you are planning to sow a few seeds in the greenhouse, ensure the propagator is turned on for 24 hours before sowing seeds. Remember too, a part of the greenhouse can be kept warmer by using polythene bubble plastic to divide up the greenhouse. • If you need to move shrubs, trees or roses, remember there are only six weeks left to undertake these moves. You would be surprised at how many letters I get asking if shrubs can be moved when the leaves are opening. 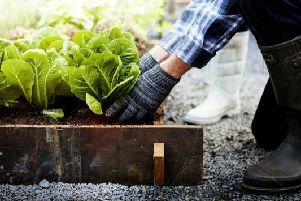 • Leave planks of wood on the soil once it has been dug and turn the wood over once a week and squash the slugs which love to hide below the wood. This will reduce the slug damage problem considerably. In small gardens, use upturned half-grapefruit skins and inspect these daily, killing the slugs by giving them the size 8 treatment! • Are your secateurs really sharp? It might be a good idea to put that garden centre token towards a new pair. • Have you thought how useful a soil warming cable could be? Have a look at the garden centres and you will see on the box how easy it is to install one. • Does the mower need servicing? There is a three-week wait at the moment, so don’t leave this job until spring. If you are confident the mower is OK, start it up once a month so none of the parts seizes up in the damp conditions. Start up the rotavator too to ensure it will start easily when needed in spring. • If it’s windy when digging, always work with your face to the wind. This prevents bad backs.